As the number of immigrant children and children of immigrants in the U.S. has grown, child welfare agencies are serving an increasingly diverse spectrum of families, including many with at least one parent or some children who were born outside the U.S. To improve their work with these families, a number of child welfare agencies have in recent years developed Memoranda of Understanding (MOUs) with foreign consulates promoting cooperation in cases involving children who are nationals of another country. 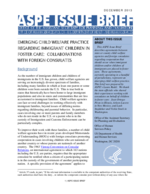 This ASPE Issue Brief describes these agreements which currently operate in a handful of jurisdictions and represent an emerging child welfare practice. The issue brief analyzes the content of MOUs or similar documents from 6 states and 5 counties. In addition, interviews with officials responsible for implementing the agreements or policies in three states (IL, NM and WA) provide information about the history and utility of these agreements. Staff in States using these agreements consistently reported that cases involving immigrant families proceed more smoothly when consulates are involved from the early stages of the case. Involving the consulate from the outset can ensure the parents and children are properly represented and can prevent delays in notifying family members of children’s placement in foster care and helps avoid complications related to permanency decisions.